Locky Law (LL): Hello everybody! Today we have Mr. Eric Tang, a member who contributes quietly and greatly to the EV community by writing numerous emails to car park management and related government department with just one goal in his mind -- improve the situation of non-charging vehicles parked at charging spots in Hong Kong. Welcome Eric, glad to have you with us today! Eric Tang (ET): Hi Locky, thanks for having me today. As an advocate of EVs and a strong believer of the results EVs will bring to the society, it is my pleasure to participate in various initiatives and work towards a better living environment for everyone in HK. One of the most important factors for EVs in HK to be successful is to have a good public charging infrastructure throughout the city in order to encourage more people to switch from petrol cars to EVs. LL: So, Eric, let's begin with some standard questions for you. Please tell us something about yourself, your family and your car. ET: My car is the Model S 85kwh, with the Premium Package and Pano roof in Deep Blue Metallic. I didn’t want to add too many options - not even the AutoPilot Feature. Not that I don’t like the options, but in order for me to keep the car as affordable as possible, I have to gave up some nice non-essential options, such as Smart Air Suspensions, 21” rims and Next Gen seats. It is just a simple non-D / P version. P is just simply out of budget for me and I don’t need the extra speed. For D, it would have been nice to have, but with the longer delivery waiting time and considering that the Dual Motor is not needed practically in HK, as opposed to the snowy weather in colder climates, I have opted for the cheaper 85 RWD model. I have a small family with just my wife, myself and our little puppy. Occasionally I drive my parents around too, so this Model S is great for me to fit all 4 adults comfortably. LL: I totally love my 60kWh RWD, I think it is more than enough for Hong Kong. So, what do you love about your car most? You are allowed to give multiple answers. ET: This Model S is the perfect car for me. I love everything about it - Zero Emission, great performance, handling and acceleration. It has one of the best ranges available now for EVs. It is also clean, quiet, cool (as in not hot) but of course it also looks really cool. I can just go on and on about it. Annual license fee is only around 1,000 HKD, which is a lot less than an ICE. The car has no engine and the motor is small so it allows a lot of space for storage and passenger comfort. Last but not least, it has been rated as one of the safest car in the world. There are just too many good things about this car. I am going to pick 3 points. Firstly, my favourite is probably the instant torque acceleration - it is great for uphill and quick overtaking. Second is all the high tech features in the car, for example, using the mobile app to remotely control some functions of the car. It is simply great to turn on the aircon of your car to pre –cool it on a hot day. Third is the large storage space available, the frunk and trunk give me loads of room to store many things. LL: And you'll definitely need a bigger battery pack than I do, since you live quite far away from the city. While we are on this topic, how often do you drive and where do you normally charge? ET: I drive almost everyday and I charge it slowly on an ordinary 13 amp plug if it is available at the Olympian City parking lot during work hours. Otherwise, I will use the Medium single phase charger at the Star Ferry Public Car Park if I am low on battery. A typical work day from 9 am to 7 pm can easily get it charged to 100% with Medium single Phase speed (32km per hour). As for slow charging 13 amp (9km per hour), 90km can be charged which is more than enough to cover my round trip journey for a typical work day. Basically, I tend to charge the car whenever possible, even if it is slow charging. For me, one of the major differences for driving an EV instead of ICE is not to let my battery go down to the warning light before topping up, unlike most people driving an ICE, whom will let their fuel tank go down to a very low level before topping it up in one go. I actually find this even better than an ICE because all I need to do is to plug in whenever it is available then my car can recharge the mileage that I just used to get there. If you think about it, in a way it actually saves time. LL: And you see tonnes of ICE problems at these locations, hence that SCMP article of yours. What was the message you wish to convey in that story? ET: As you see from my answer in the last question, you can see why an EV is actually better than an ICE because you don’t have to detour to visit the smelly petrol station to fill up your tank. What I am trying to say is that apart from all the positive things about EV, one of the most important requirements for EVs to be successful is to have good charging infrastructure everywhere in the city and the Government must help EV owners to set up either a home or work charger. In Hong Kong, it is especially difficult, as most people are living in apartments, which do not have fixed parking spots. 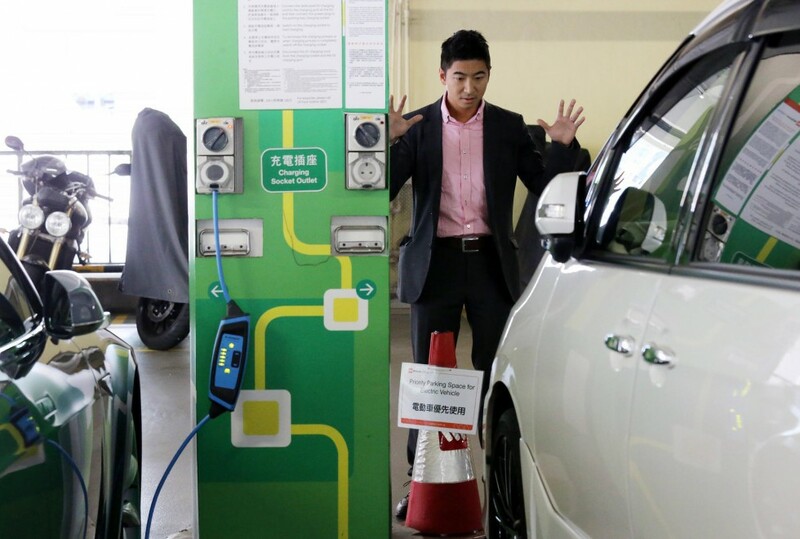 The SCMP story was all about the availability of public charging to EV owners in HK and the message was to urge the Government and car park management to work together quickly to resolve the difficult charging situation in HK. With the growing number of EVs everyday, both parties must now act quickly before it is too late. Ultimately, most of the owners in HK rely solely on public charging networks and they will be the ones who are going to suffer. LL: So if we happen to be visiting certain car parks and all fast/medium chargers are occupied by non-charging EVs or ICE, what should we do? ET: You should report it to the car park management and also leave a message on the cars. I have all different messages printed out and ready in my car, so whenever these kinds of situations happen I can just quickly pull out the right message and clip it on to their windscreen wiper. If I have time I will also try to take a photo of the cars and post and share it to different social networks, such as Facebook groups and chat groups to report them. LL: Well then, do you have a "10 point pitch" for the Government in solving this problem? ET: The Government should start as a good role model to everyone by making all the charging spots in Government public car parks for charging only. One simple rule they can follow is that whenever there is an ICE or non-charging EV occupying the spot, the car park staff can clamp the car, followed by a fixed penalty. It is actually very easy to implement - the car park staff doesn’t have to remember which car model or brand, they can simply do one quick check on whether a cable is plugged into the car or not during their normal routine check. Just apply the clamp when they see no cable, and no warning is required. Once this is successfully implemented then the Government can set this as a guideline for all other private car parks to follow. LL: Okay. Moving back the focus to Tesla EVs. As we all know, Tesla EVs by far the most popular EVs in Hong Kong, and the growing number is actually both encouraging and for some, worrying. Voices asking for more Superchargers (SC) can always be heard, so, hypothetical situation: where would you choose to have the next Supercharger? ET: Somewhere in the New Territories and near the airport. Also somewhere with a big open area would be ideal for a SC location with a capacity of more than just 4 stalls. Just like the U.S., perhaps a location just off the highway with 8 to 10 stalls of open area SC, although this may be difficult for HK. However, somewhere near the Gold Coast or north of N.T. could be a good location for some owners around that area. Actually instead of opening up any new location, I think they should really try to expand some of the existing ones. Places such as SP, Olympian City, Panda Place are all extremely busy and all already have the capability to expand. LL: What Supercharger to Tesla Model S ratio do you think will be adequate for Hong Kong then? 1 to ...? ET: There are 44 SC stalls in HK now but I’m not sure on the exact number of Tesla’s here. Perhaps 1: 0.3 SC would be adequate in HK, which is quite high ratio. However, this is considering the unique situation for HK which is that most people are without home charging. LL: And the long term solution is...? ET: The long term solution is definitely to set up home or work charging. Otherwise, I believe the next long term solution is to properly regulate the charging spots in public car parks so that it is used for charging only and not simply for parking. Furthermore, for all the newly built / renovated parking lots, the developer should consider putting a 13 amp slow charging socket into all the parking spaces and only block a few spots for medium charging only. This kind of setup would be good for everyone as EV owners can just choose to charge slowly when they are not low on battery and not have to worry about the ICE issue since all the spots will have a free plug available. The medium and fast chargers should be properly managed and regulated by the car park management and reserved for charging only. So if anyone is not using it properly - no matter it is an EV or ICE - then the cars should be clamped with a penalty fine. LL: Tesla Model 3 has just been unveiled on April Fool's day, what do you think about this much anticipated EV? ET: I think the Model 3 looks great. It looks very much like a Model S but also has a bit of Model X in it too. At USD $35,000, you cannot get a better car than this. It is green, fast and packed with latest technology. This car is going to change the car industry. All the major car makers around the world should be worried now after knowing that Tesla received 320,000 plus reservations in just 1 week. It is a truly remarkable feat. I am so excited about this new EV, not only because of all the good features. I am excited because we are finally seeing the massive support on EVs around the world and with that price tag it is much more affordable for everyone to switch to an environmentally friendly car, which can reduce roadside pollutions. LL: Will you get Model 3? ET: Definitely, I have ordered Model 3 online as soon as the site was available before the unveil event. LL: Last but not least, probably the trickiest question, do you agree with Elon that Hong Kong is really be a "beacon city" for EV? ET: I do agree with Elon on that. HK is actually similar to some big cities like London, which is packed with buildings and small roads, and is not easy to set up home charging for most apartments. Therefore, if Tesla can be successful in HK and set a good example to everyone else around the world, then surely HK can be a beacon city for EV. Once again, the Government holds the key in making this successful. LL: Thank you for your sharing, Eric! It has been a pleasure interviewing you!